Aroon Oscillator line above the zero — suggestion of a bullish market. Aroon Oscillator line below zero — a bearish market. The further the Oscillator line is from Zero level, the stronger the trend. When values are near Zero line, the market is trending nowhere. 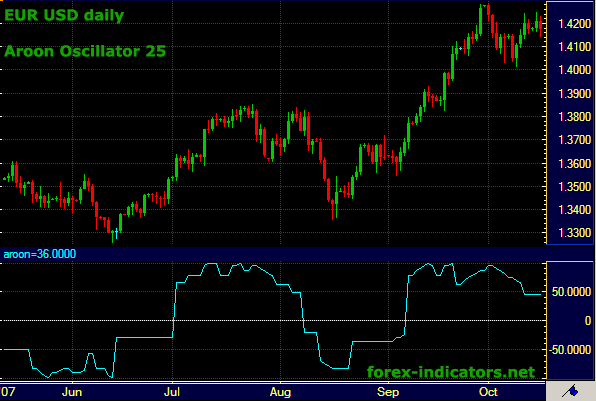 Aroon oscillator is based on Aroon Indicator. Aroon Oscillator is a trend-following indicator that illustrates the strength of a current trend and its potentials to last. An oscillator that oscillate between -100 and 100. It oscillates around zero line, defining times when AroonUp and AroonDown lines of Aroon Indicator cross each other. Aroon Oscillator = AroonUp - AroonDown. The positive value of Aroon Oscillator indicates an uptrend, while the negative value indicates a downtrend. The higher the absolute value of Aroon Oscillator, the stronger the trend. Aroon oscilators is da bomb especialy when used with the macd. 136 pips da day guys. I'm using MT4 without Aroon indicator and Oscillator. So, how to set this tools? There seems to be a problem with the second link Aroon_oscillator_v1mq4 when I try to download I get message file not found. I am finding this site a wealth of knowledge. Rob. You should Right Click and choose "save link as"
why not use 4 hours chart and see how it works. Have you a forex robot for the arron indicator ?